Richard John Parfitt was born in Woking, Surrey, on 12 October 1948. He began playing a guitar when he was 11 and, on leaving school at 15, got a job performing at Sunshine Holiday Camp in Hayling Island, Hampshire, earning £5 a week. However, much of his new income went to his father, who was a committed drinker and gambler. "He was forever getting in trouble and coming to me crying," Parfitt later recalled. "I probably ended up giving him a couple of thousand quid in total. Back then, that was a lot of money." Parfitt met Francis Rossi in 1965 when they were both playing with their respective bands at a Butlin's holiday camp in Minehead. Two years later Parfitt, along with Rossi, Alan Lancaster, John Coghlan and Roy Lynes came together to form Status Quo. The band's first hit, Pictures of Matchstick Men, released in 1968, embraced the psychedelic movement of the time and went to number seven in the UK charts. Their follow-up, Black Veils of Melancholy, failed to chart but they did get to number eight with Ice in the Sun, written by Marty Wilde. But the band were becoming disillusioned with the direction they were taking. They abandoned their flowery clothes, embraced denim and T-shirts and settled down to a more traditional style of rock. Parfitt co-wrote two of the tracks on their breakthrough album, Piledriver, released on the Vertigo label in 1972. In an interview in 2014, Parfitt said of the record. "You know what? I love every track on that album! I think All The Reasons is just such a beautiful song. I wrote that about my wife at the time." The album became the template for subsequent releases, with Parfitt receiving a number of writing credits. Whatever You Want, co-written by Parfitt and Andy Bown, became one of the band's biggest hits and a staple of their increasingly popular live shows. Outside the Quo tent the musical landscape was changing, from prog to punk, and into the '80s with the New Romantics. Inside the tent, the band continued to play their 12-bar blues style maintaining an ever loyal fan base. The band set off on a farewell tour in 1984 but decided to carry on after Bob Geldof persuaded them to open the Live Aid concert the following year. "God, I'm so pleased we did it now. 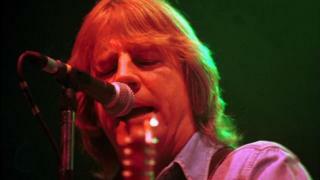 Quo opening Live Aid, it was meant to be." They also embraced the hedonistic rock lifestyle with gusto. Parfitt admitted spending £1,000 a week on cocaine and another £500 on vodka. His addictions, coupled with the tragic drowning of their two-year-old daughter, Heidi, led to the breakdown of his first marriage to Marietta Broker. "It's not buying the drugs that is the most expensive thing," he later said. "It's the divorce which taking drugs eventually leads to." He later married Patty Beedon, who had been his childhood sweetheart. The couple divorced and reunited again, before finally going their separate ways. It was an acrimonious separation, with Patty later describing him as "a selfish child who never grew up". Parfitt's experience of paying millions in divorce settlements made him vow never to marry again, but he tied the knot again in 2006 with Lyndsay Whitburn, a fitness instructor. In 2010, Parfitt and Rossi were awarded the OBE for services to music, posing together with their gongs after the investiture ceremony. By this time Parfitt had suffered a number of health problems including undergoing quadruple heart bypass surgery in 1997. He made a full recovery and was performing with the band within a matter of months. Doctors warned the musician that he would have to leave behind his rock lifestyle, although he admitted at the time that he still enjoyed "the odd pint". By 2014 he was living a relaxed life in Spain. "I haven't smoked a joint for 27 years and I haven't done any cocaine for 10 years. I just do normal stuff - the kids keep me busy and I go shopping with the missus." Other band members came and went over the years but Parfitt remained, with Rossi, the definitive face of Status Quo. While Rossi officially remained the band's frontman, the musical partners were hard to separate on stage. In contrast to the rows that are part of many rock bands, the two remained good friends throughout the decades. When Status Quo had embarked on what they hinted would be their final tour, Parfitt offered an explanation for the longevity of veteran rock bands. "Why do you think all these bands like the Stones and Deep Purple stay on the road? We're having fun and I love being up there on stage. Once the lights go down and the crowds roar, something magical happens. All your aches and pains go." He added: "It would be weird to just stop because I would have nothing to do."